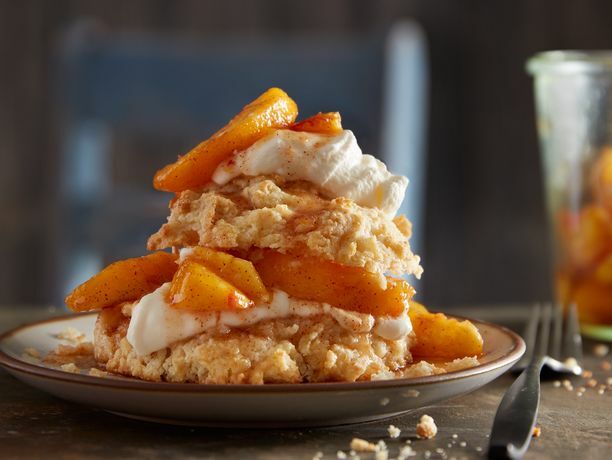 A perfect summertime dessert: tender, buttery shortcake biscuits, juicy peaches and sweetened whipped cream. Using 1/3-cup measuring cup, drop dough to form 8 shortcakes about 2 inches apart onto cookie sheet. 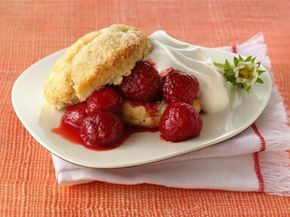 Sprinkle tops of shortcakes with 1 tablespoon granulated sugar. Bake 14 to 18 minutes or until golden brown. Remove from cookie sheet to cooling rack; cool completely. When ready to serve: In large bowl, mix peaches, 1/4 cup granulated sugar and the cinnamon until well coated. 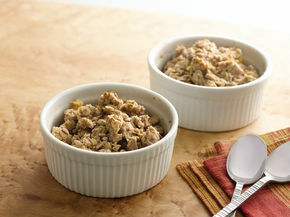 In chilled medium bowl, beat whipping cream with electric mixer on medium-high speed until slightly thickened. Reduce speed; beat in powdered sugar and vanilla. Increase speed; beat mixture until stiff peaks form. Split shortcakes in half horizontally. Spoon filling and sweetened whipped cream between halves; replace tops. 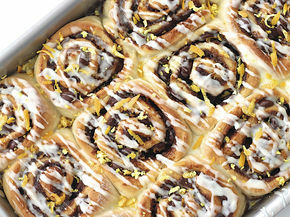 Top with additional filling and sweetened whipped cream. Spray measuring cup with cooking spray to prevent dough from sticking when dropping on cookie sheet. To easily peel fresh peaches, blanch them in boiling water about 15 seconds. Remove from water with a slotted spoon, and they’ll be super easy to peel with a paring knife. 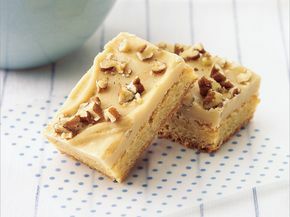 Rich brown sugar frosting slathered on rich vanilla bars - yum.